Dr. Andrea Steen is a native Windsorite and well respected family physician. Born Andrea Page on September 4, 1956, Steen went to on enjoy a successful career in the sport of track and field, eventually competing in the 400-meter hurdles during the 1984 Olympic Games in Los Angeles, California. Steen excelled as an athlete from a young age; as a student of F.J. Brennan High School in 1970, she won her first WSSA track and field event at age 13. She went on to win additional WSSA titles for hurdles in 1972 and 1973. Andrea earned a nursing degree from St. Clair College in 1975 before going on to study Human Kinetics at the University of Windsor. While a student there, Steen established the 400-meter hurdles as her specialty and went on to win OUAA titles for the sport in 1978 and 1979. After graduating from the University of Windsor, Steen moved on to the University of Waterloo and earned a Master’s degree in Science in 1981. Despite Waterlo’s lack of an outdoor track program, she was still able to compete indoors. At the Canadian Inter-university Athletics Union National Championships, she earned bronze medals in both the 300-metre and 600-metre races, and her team won gold in the 4-by-200 metre relay. Steen continued to pursue a career in amateur athletics after graduating from university, setting Canadian Records at both the 1982 Canadian Championships and the Commonwealth Games in Brisbane, Australia. She placed sixth at the World Student Games in Edmonton in 1983 and the Pan American Games in Caracas, Venezuela, and made it to the quarter-finals at the World Championships in Helsinki, Finland. Andrea placed first at the Canadian Olympic Trials, and made it to the semi-finals at the 1984 Los Angeles Olympics. She went on to reach the semi-finals in the 1986 Commonwealth Games and in the same year, won the bronze medal in the Canadian Championships. 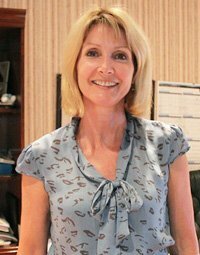 After retiring from competition in 1986, Steen attended Medical School at McMaster University and returned to Windsor in 1991 to open her own family practice. Since 1988, Dr. Steen has been married to Olympic bronze medalist, Dave Steen and has four children. Dr. Steen was inducted into the Windsor-Essex County Sports Hall of Fame in 1995.